Get ready world! 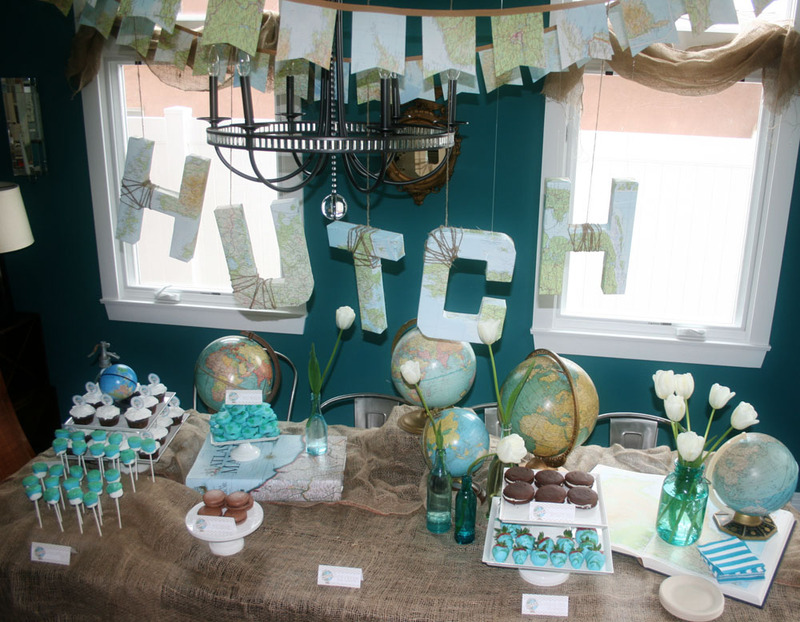 My nephew Hutch is on his way! To celebrate, Crafty Jan & I threw my sister Ellie a wordly sprinkle. 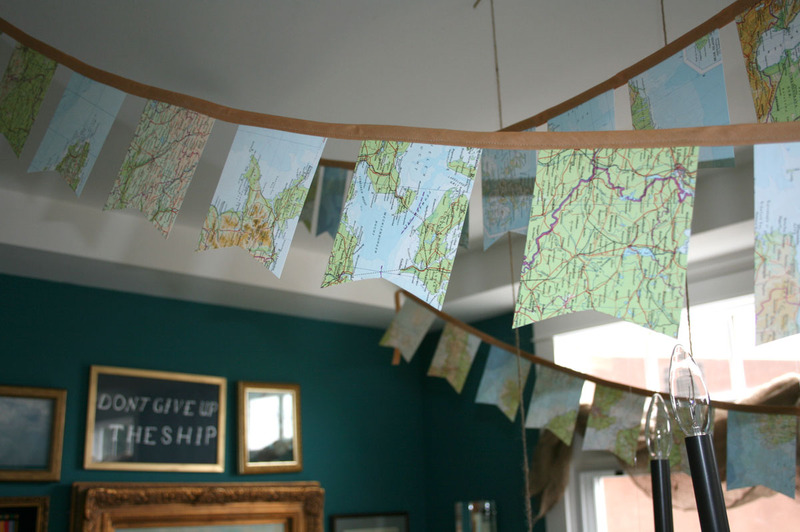 I’ve been wanting to do something with globes for the longest time, and since Ellie is doing a mapped up nursery, this theme fit the occasion perfectly. My mom found an enormous atlas at a used book store for $12 and we cut it up (which actually kind of pained me a bit!) 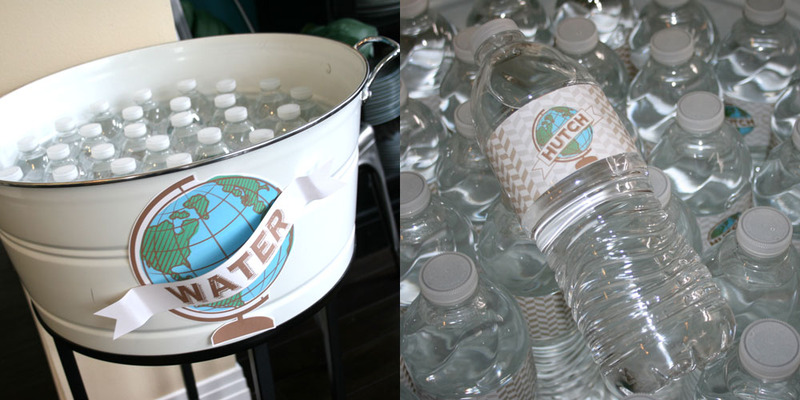 to use as envelopes and as a backing to the invitation (and much more as you’ll see throughout the party.) I love how those envelopes looked. 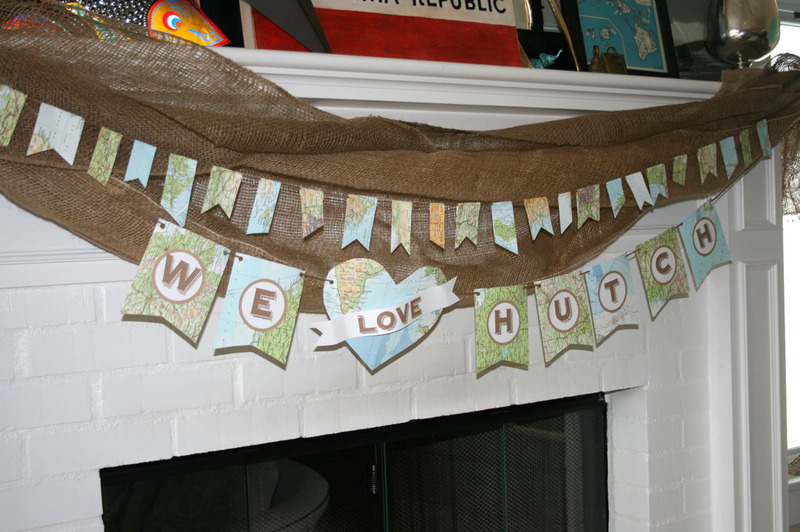 As for the invites, I printed the “Hutch” banner separately, then sewed it onto each with my sewing machine so that there would be a little bit of a 3D pop. So let’s welcome this little one into the world. We had the shower at 7pm on a Thursday night with Ellie’s local friends to try to keep it on the low key side. We also decided that we wouldn’t focus on anything actually good for you to eat and went straight to desserts. The invite said it was a “cupcakes & cocktails” party but we had a few more sugary items to choose from! 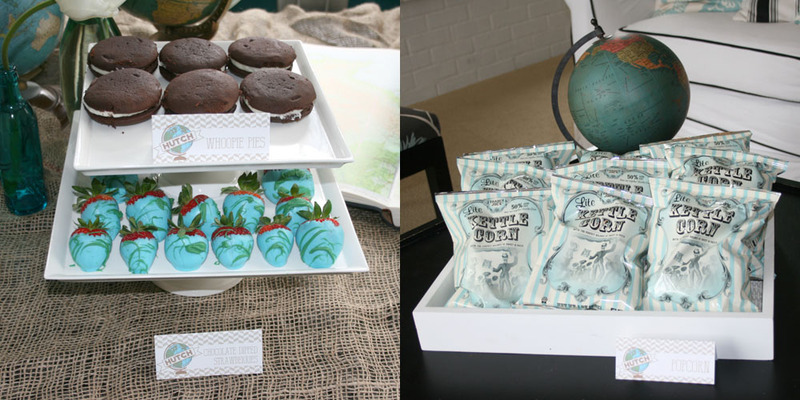 Cupcakes, marshmallow pops, chocolate covered strawberries, macaroons, whoopie pies, mini ice creams, popcorn, and “Oreo worlds” filled our tummies. In case you’re wondering where those beautiful cookies came from (ha, ha!) I proudly admit that they are another failed attempt at confection perfection by yours truly. In my head they were so much cuter but you get the idea! I dipped Oreos in candy coating, waited until they were dry, then took a stencil I made with cardstock and an x-acto knife and spray painted them to look like worlds with edible spray paint. Honestly, why I keep trying to make it work in the kitchen is beyond me. I’m telling myself that they were made with extra love. Moving on! 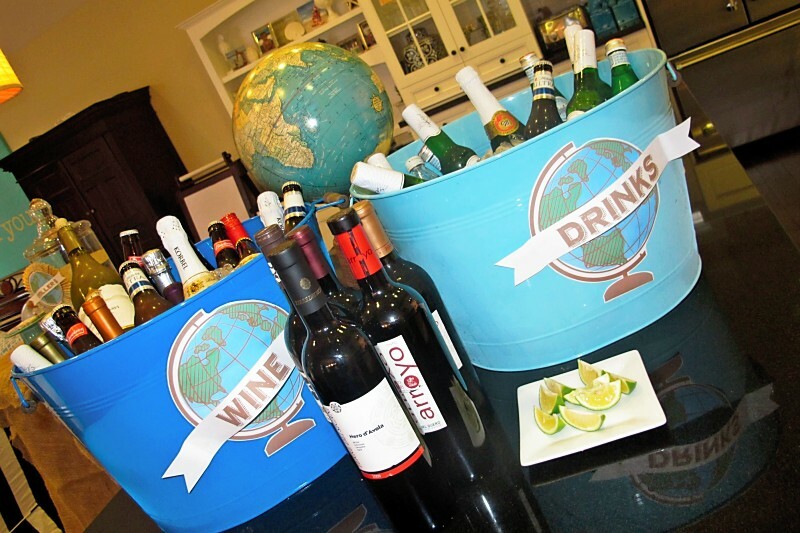 We used burlap through the party… which is a nice, inexpensive way to add some texture. I bought 12″ paper mache letters from Jo-Ann’s, covered them with pages from the atlas and strung them from the ceiling using fishing line and jute twine. It was probably my favorite thing about the party… and I was even happier that Ellie liked it so much that she’s planning on hanging these in Hutch’s room. 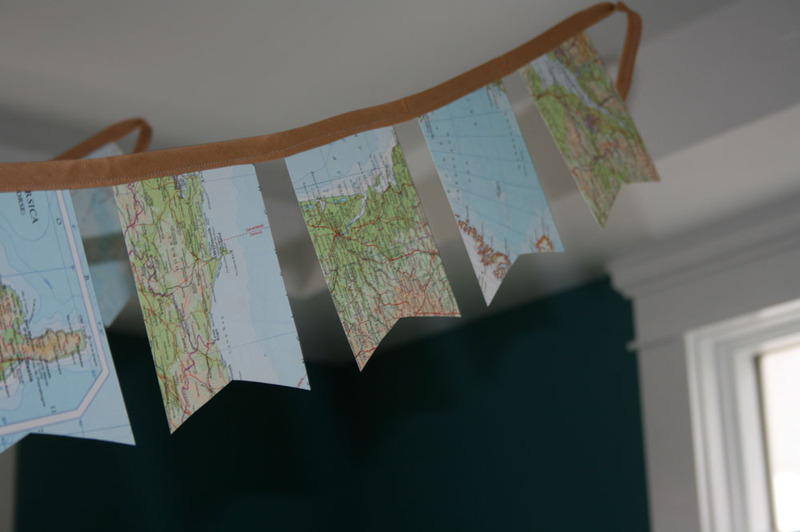 Ripping more pages out of that fabulous atlas, we made bunting by sewing them together with seambinding. I think I am addicted to this atlas! 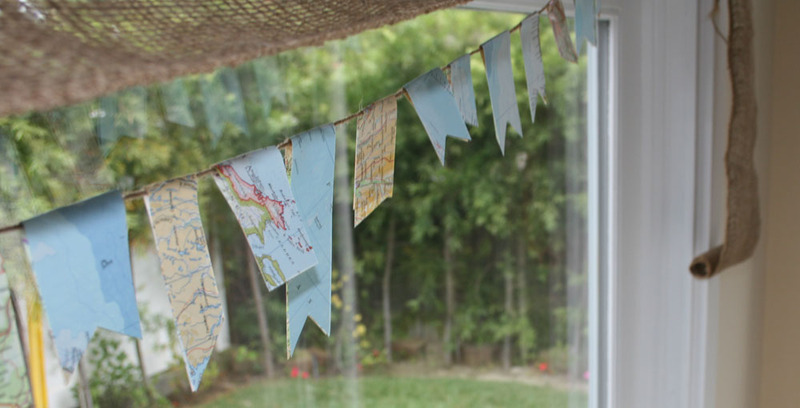 On the mantle and in other parts of the house, I cut smaller strips of the atlas in varied sizes and strung them together over the jute twine. They are super small and cute. I think I am going to keep them up forever. Okay, at least until the next party. The atlas even worked heart-shaped. Aren’t they cute? My mom has a pretty big vintage globe collection which made decorating a breeze. I added in the couple I had as well and we were all set. I’ve collected blue bottles for years so we pulled those out and put fresh white tulips in them. Simple, simple. In case you’re wondering, that white thing above is the ice cream holder… which is really an old art marker holder that we spray painted white. I took these photos before the party began which is why it’s ice creamless. 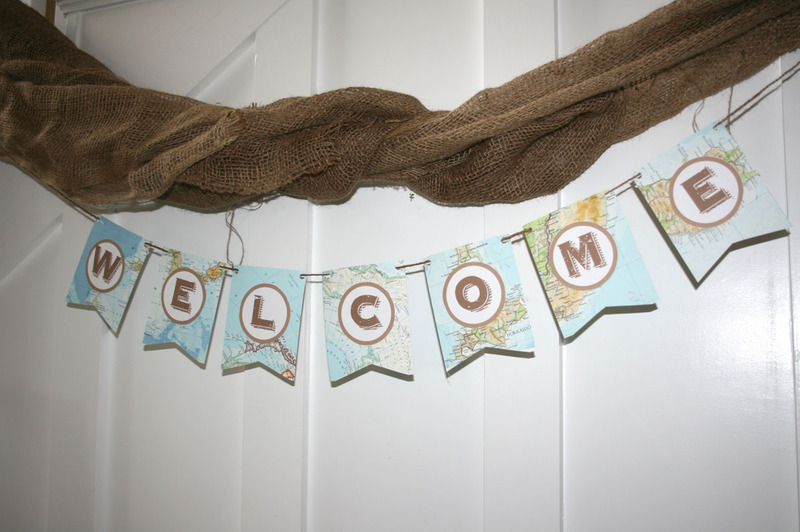 My mom gussy upped the signs with rope and rosettes made from the atlas pages. Water was cute, but wine was much more fun! 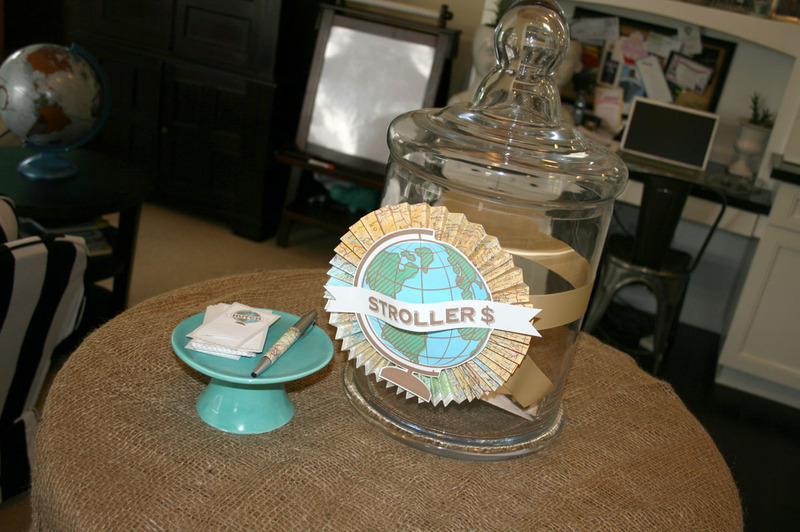 Instead of having guests bring gifts, we noted on the invitation that no gifts were necessary, but if they were so inclined, we’d have a “Double Stroller Donation Jar” they could contribute to. Though Ellie is having a different gender this time, she’s got all the clothes she could possibly need since this little nephew of mine has 3 older boy cousins’ hand-me-downs. What she really could use was a double stroller. It worked out great. No presents were opened at the party, and she will definitely be able to get her double stroller now… which is probably the most necessary item a mom of two needs. 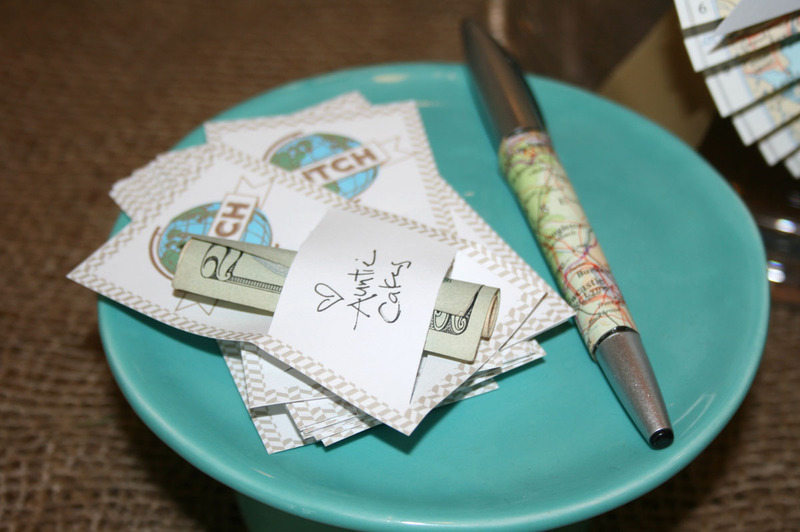 Most people brought their donation in cards, but if they just brought some bills, I had business card sized papers they could write on and slip their moola through. Ellie had my brother-in-law Elliott (yes… Ellie married Elliott!) come by to sneak a peak before the party. Aren’t they the cutest? 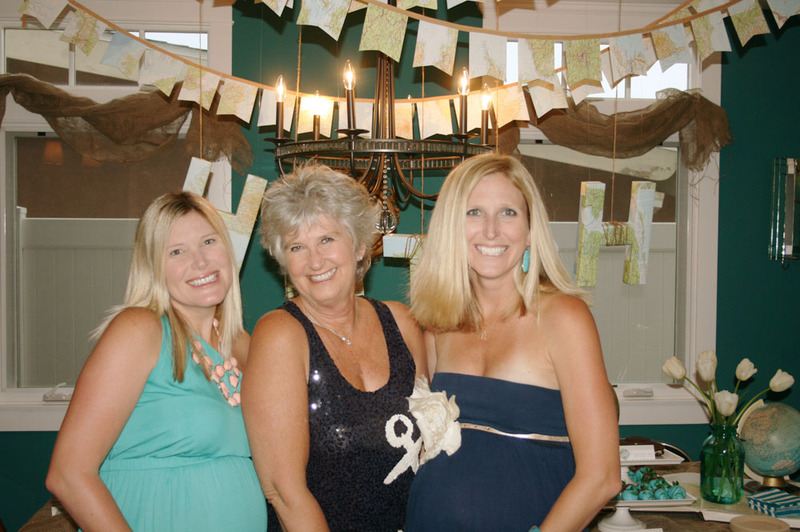 We had a full house of fabulous friends to celebrate this little munchkin… and it seemed like half of them were pregnant too! Lots more baby parties in our future, methinks! For favors, we repackaged lip glosses. We were well aware that lip gloss and worlds go together like… well lip gloss and worlds… but we try to give favors that people may actually take and use. We were actually looking for those cute chocolate globe candies but couldn’t find them in time. The last of the guests didn’t leave until nearly midnight… which in pregnancy terms is like partying until sunrise. We pregos felt super hungover the next day even though all we drank was Pellegrino! 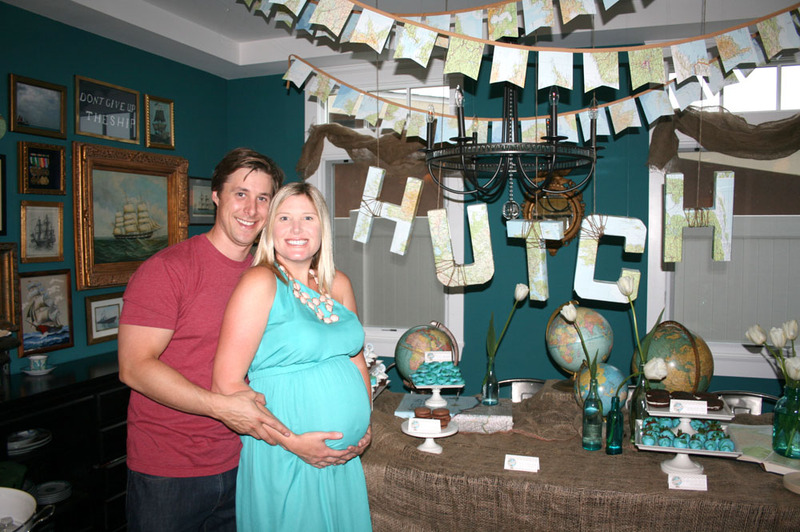 We had the best time on EARTH, the biggest blast on the PLANET, and we love little Hutch more than anything in the WORLD.